Earlier this year, as part of special counsel Robert Mueller’s investigation, the Justice Department charged 13 Russian nationals with interfering in American electoral and political processes. The defendants worked for a well-funded “troll factory” called the Internet Research Agency, which had 400 employees, according to one Russian news report. From a bland office building in St. Petersburg, the agency ran a sophisticated and coordinated campaign to sow disinformation and discord into American politics via social media. This often involved Trump’s favorite medium: Twitter. Millions of the trolls’ tweets have since been removed from the service, and while other outlets, most prominently NBC News, have published samplings of them, it has been difficult to get a complete sense of the trolls’ strategy and the scale of their efforts. Until now. The data set published here includes 2,973,371 tweets from 2,848 Twitter handles. It includes every tweet’s author, text and date; the author’s follower count and the number of accounts the author followed; and an indication of whether the tweet was a retweet. The entire corpus of tweets published here dates from February 2012 to May 2018, with the vast majority from 2015 to 2017. Even a simple timeline of these tweets can begin to tell a story of how the trolls operated. For instance, there was a flurry of trolling activity on Oct. 6, 2016. As the Washington Post first pointed out using the Clemson researchers’ findings, that may have been related to what happened on Oct. 7, 2016, when WikiLeaks released embarrassing emails from the Clinton campaign. 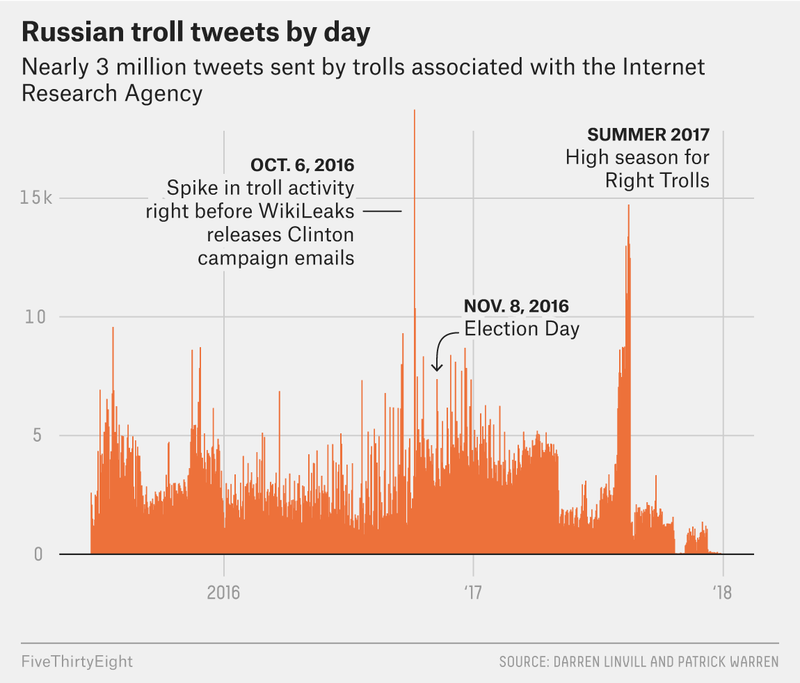 There was another big spike in the summer of 2017, when the Internet Research Agency appeared to have shifted its focus to a specific type of troll — one the researchers call the “Right Troll” — that mimicked stereotypical Trump supporters. When Twitter suspended these malicious accounts, it also deleted their tweets from public view. Reassembling this corpus of tweets is an exercise in a certain kind of national security. “Wiping the content doesn’t wipe out the damage caused, and it prevents us from learning about how to be better prepared for such attacks in the future,” said Alina Polyakova, a foreign policy fellow at the Brookings Institution. But data archives can help rebuild this important piece of recent American history. 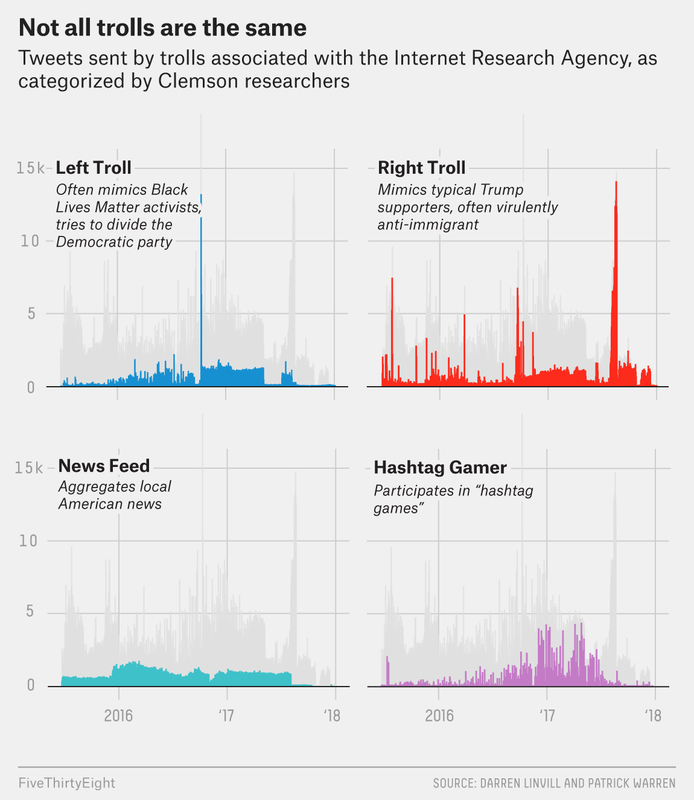 The Clemson researchers were able to gather this data thanks to Clemson’s Social Media Listening Center, an interdisciplinary lab that captures “more than 650 million sources of social media conversations,” including Twitter, according to the center’s website. It is run on powerful Social Studio analytics software — produced by the firm Salesforce and typically used by public relations and marketing companies to check up on their brands. The program drinks from Twitter’s so-called firehose of data, archiving the tweets soon after they’re posted. This war may or may not have had an effect on the 2016 election, but it certainly wreaked havoc. The man who would be named national security adviser followed and pushed the message of Russian troll accounts, according to the Daily Beast, and Trump’s eldest son, campaign manager and digital director each retweeted a Russian troll in the month before the election. Twitter itself informed 1.4 million people that they’d interacted with Russian trolls. But the researchers emphasized that the Russian disinformation and discord campaign on Twitter extends well beyond even that. “They are trying to divide our country,” Linvill added. The Clemson researchers wish to acknowledge the assistance of the Clemson University Social Media Listening Center and Brandon Boatwright of the University of Tennessee, Knoxville.